Share your outdoors with friendly avian neighbors using the Home Bazaar Yellow Backyard Bird Cottage. The familiar architectural elements and bright yellow color make this home a welcome addition to your garden, for you and your feathered friends to enjoy. Its tall shape, pitched roof, and wraparound porch all evoke elements seen on homes throughout neighborhoods, creating a remarkable garden accent. The bright yellow color enhances your landscaping, while the white trim offers contrast. Colorful fabric flowers in window boxes and a hanging basket bring even more style to the piece, and the window and door shapes add depth. A 1.25" diameter entry sits near the top of the home, protected by the overhang from the pitched and shingled roof. The generous interior offers songbirds a wonderful roosting spot, and this tall design helps the nesting area stay cool. A drainage hole on the base allows any captured water to escape the unit, and the back panel removes easily for nest checks. Screening beneath the entry forms a ladder, allowing fledglings to reach it when ready to exit. This home's wooden construction creates a hardy piece, and the flat base may be pole or post mounted with a mounting bracket (not included). Use the hanging tab on the back of the item to attach it to a tree, fence, or wall with just a screw for more display options. 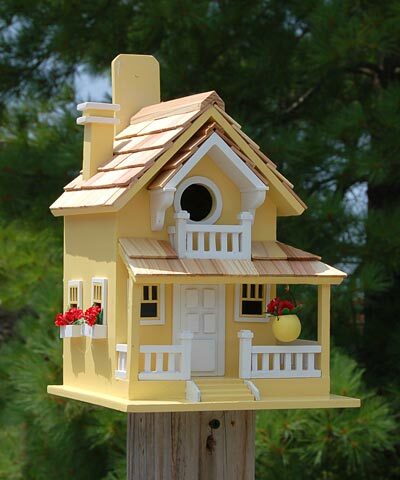 Create an avian neighborhood in your yard with this Yellow Backyard Bird Cottage.